I love how it came out so much that I decided to add it to the site. Thanks Karleen! 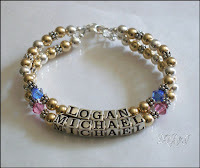 I also added a new bracelet to the Happy Birthday line. 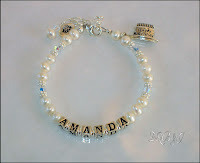 This one is personalized and is available in crystal,crystal pearls or freshwater pearls. Again this was a customer suggestion. Thanks Lori!